Mailed 4/21/17 to Subscribers. Allow 4-6 weeks for USPS delivery. Armies of the White Sun - The War in China, 1937-1945: China’s two-millennia-long imperial period came to an end in 1912. What followed was decades of war and unrest. 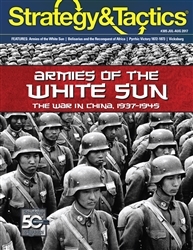 Exploiting the turmoil was Japan, who in 1937 would spark the Second Sino-Japanese War. Belisarius and the Reconquest of Africa: With the fall of the Western Roman Empire in the fifth century, the Eastern Roman Emperor Justinian embarked on a campaign to regain the lost territory. Leading this campaign was Justinian’s greatest general, Belisarius. Pyrrhic Victory - The Lava Beds War, 1872-1873: Three years before the Battle of the Little Bighorn, the US Army fought a series of brutal battles against the Modoc Indians along the Oregon-California border in what became known as the Lava Beds War. Vicksburg - Grant’s Masterpiece: Analysis of Gen. Ulysses S. Grant’s victory in the Battle of Vicksburg during the American Civil War.